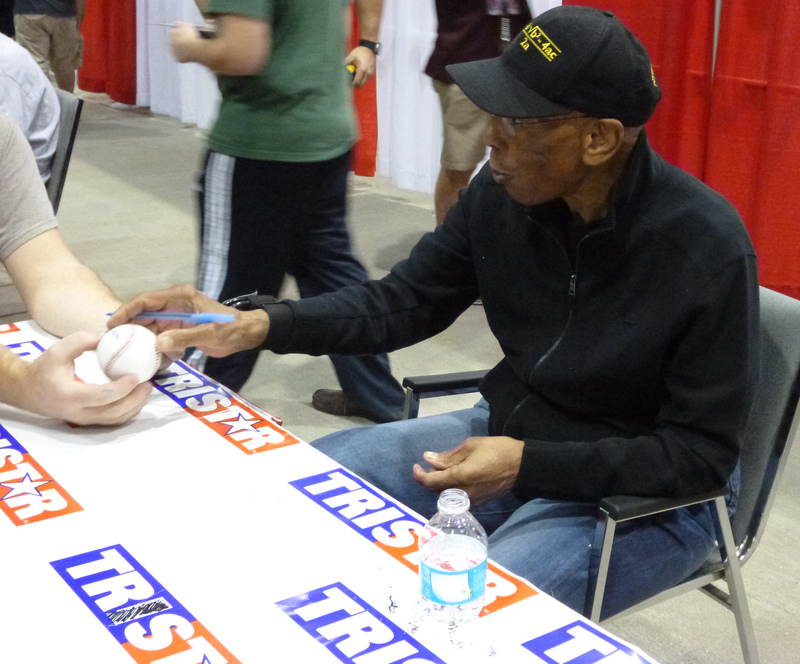 Ernie just having signed my baseball. Last Sunday I had an amazing day. It was a total surprise & I didn’t find out anything about any specifics until we were at the venue & I was looking at the list of events scheduled. Stuart took me to what I thought was a sports memorabilia show as we walked into one of the event halls at Reliant Stadium here in Houston. Then I saw a sign of events & there were all sorts of professional sports people showing up. Two of them were former Chicago Cubs Ferguson Jenkins, & my personal HERO – Ernie Banks, former short-stop back in the late 60s/early 70s. My husband had purchased the tickets two weeks prior to the event. Stuart had bought me an autograph ticket for each Chicago Cub & he bought 2 baseballs so I could get them signed by each player. I stood there in front of the sign of that day’s events & when I realized all this I became overwhelmed. My knees began to shake and I just broke down and cried in front of everyone there. I was completely taken by surprise. No one knows this. I have kept a secret since 1995 and I held it so close to my heart that I never dared to share it with another living soul. I never told my parents, and I never told Stuart. All he knew was that Ernie Banks is my personal hero. I have had a dream since getting my doctorate in 1995 to tell Ernie how instrumental he was in that achievement, what a huge part he had played although he would have no idea. When I was six or seven I sent him a letter. I told him I was a Mexican, that no one in my family had any education beyond high school & that my own dad never graduated having the equivalent of a 9th grade education. I told Ernie I wanted to be the first in my family to go to college (a thought my mom began to put in my head when I was 4 or 5 so we did the same with our daughter & now she wants to go). I kept that picture. All through all the teasing & bullying I endured in elementary, Jr. High & high school & would look at that picture pinned to my bulletin board & tell myself Ernie would not let this type of thing get to him. He’d just go on & do what he had to do & I was going to do the same. I graduated junior high a member of the National Junior Honor Society & was 3rd in my graduating class. The autographed picture that inspired 3 degrees. I graduated high school a member of the National Honor Society & in the fall despite all the naysayers I went to Northwestern & took his picture with me. Every time the students were hateful toward me (all my professors loved me so you all know what can happen to Teacher’s Pet) or I had a hard time with a class or did poorly on an exam I’d look at that picture & be encouraged. Four years later I got my bachelor’s degree in Anthropology. Next, I took that picture to the University of California at Santa Barbara & every time I had roommate problems (I had alcoholic & drug abusing roommates, roommates with psycho & very dangerous boyfriends, and so on, it was really bad) & professors were manipulative & mean (many just used their grad students to complete research on their own projects instead of encouraging their grad students to do research on independent projects), I would look at that picture. Santa Barbara was the worst four years of my entire life & had it not been for that picture I definitely would have packed it in. Instead, I graduated with my Master’s degree in Anthropology. Finally, I took that picture to the University of Texas at Austin. Despite students ostracizing me because they were jealous, despite the chair of my dissertation committee trying to publicly steal the idea behind my thesis & attempt to claim it as her own, I would look at that picture & just keep going. I now have my doctorate. I’ve prayed I don’t know how many times to have ONE chance to tell Ernie Banks what that simple picture he sent to a then six-year-old child meant (& a second picture later to a then 14 year old). I remember praying as recently as in September around my daughter & husband’s birthdays to have ONE chance to tell Ernie because I knew he would love to know & for me to tell him before he dies (he’s 82). Ernie intrigued to hear my story. My prayers were answered on Sunday – in spades! It was AMAZING!! Ernie is as nice as I have always heard. He speaks to each fan, he just doesn’t sit there & sign the ball then hand it back to you & you go on your way. No. He asks your name, where are you from, so we got past that & then I told him that I have waited to tell him something since 1995. That got his attention. He was very intrigued & he asked me what it was. I then told him nearly word for word what I’ve just shared here. Check out the dude at the end of the table. He’s crying. iPhone! Ariel was of course taking pictures , the guy who had been in front of me getting his baseball signed was taking pictures AND crying, and Ariel said 3 people still in line who were close enough to hear were also all taking pictures of us & that some lady in line who was close enough to hear my story was also crying. Ernie thanked me and told me it meant so much for him to know this. He motioned for me to come around the table and said he needed a hug. He hugged me so tight with both arms, while those who posed with him for pictures while I waited in line to speak to him received only one arm hugs or handshakes. He put his face right up against mine cheek to cheek & he thanked me several times with a hitch in his voice. He still had tears in his eyes & then he asked to see the picture that had been such a huge inspiration to me. 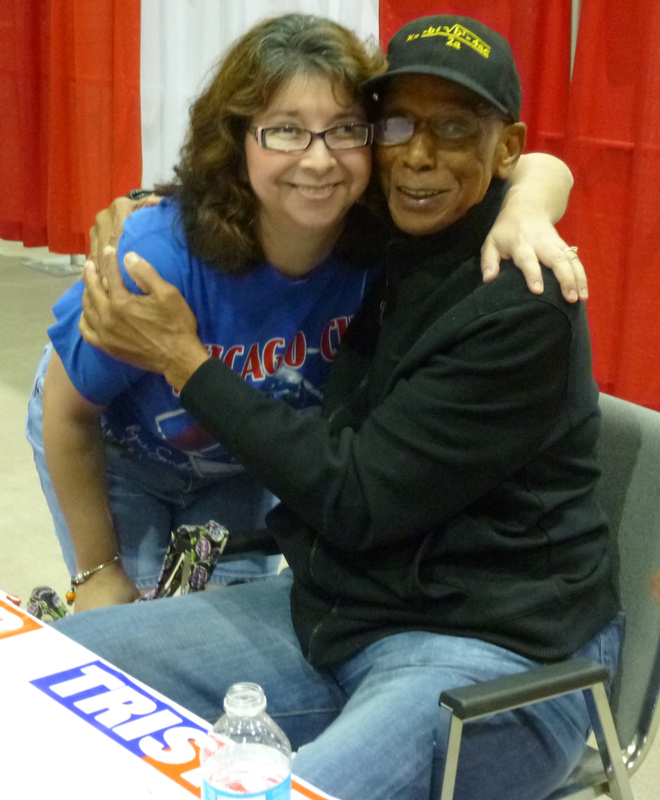 Ernie Banks & I. Reliant Stadium, Houston, TX. 1-27-13. Congratulating me on my doctorate. By that point I was seriously convinced I was dreaming. I tend to have very vivid dreams and when I dream, I dream BIG. I now have such nice pictures of Ernie & I together. My daughter took them. Coincidentally, or not as I really don’t believe in coincidences, my daughter is 14, which was Ernie’s uniform number while he was with the Cubs. He sent me that picture back in 1977 when I was 14. Also while there at the event after we met Ernie I bought Ariel a Sammy Sosa autograph that is numbered 14 out of a total of 14. He was her favorite as a little kid. There were a lot of 14’s that day, which were completely appropriate given the circumstances. Ferguson “Fergie” Jenkins & I. Reliant Stadium, Houston, TX. 1-27-13.
fog of disbelief as I kept asking myself, “did that just happen? 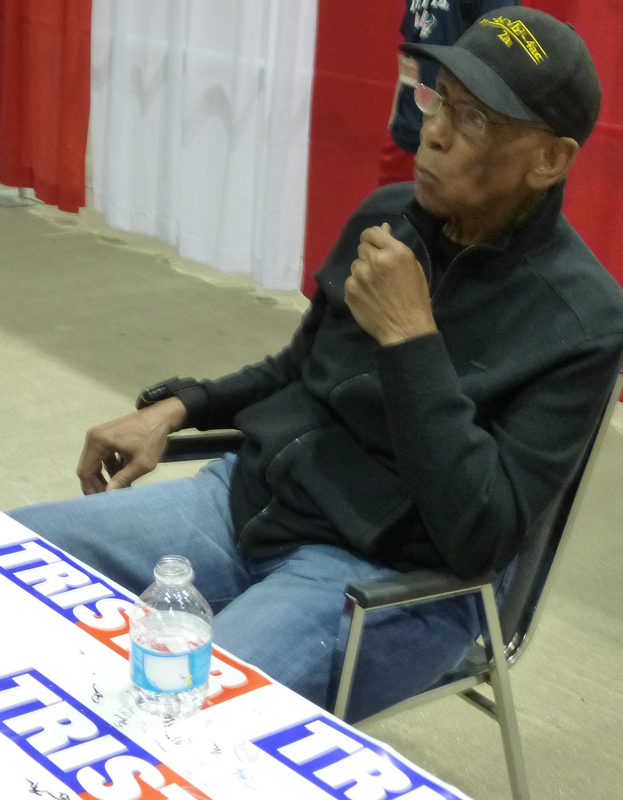 Did I really just meet and talk with Ernie Banks? 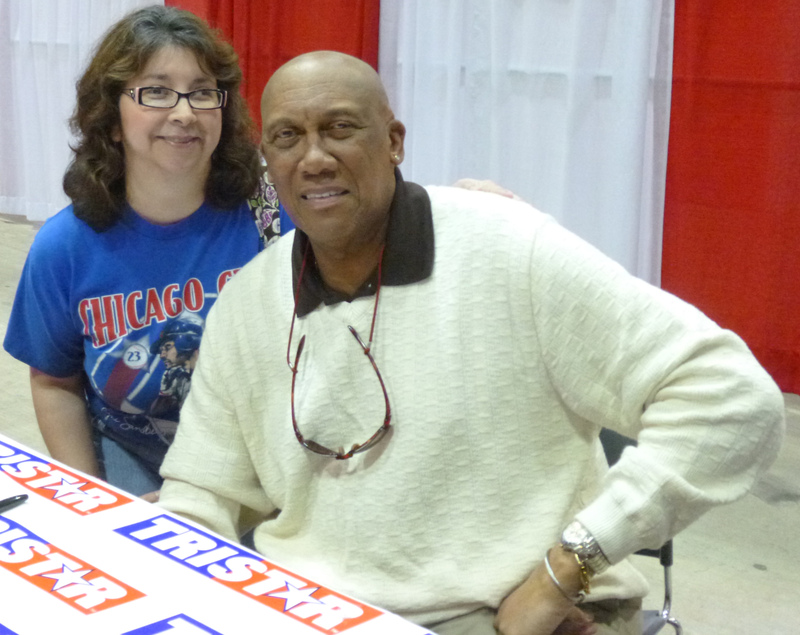 ?” I also got to meet former Cubs pitcher Ferguson Jenkins, or Fergie, as he is affectionately known. He was nice, but not nearly as friendly as Ernie. He also let me pose with him for a picture. They’re not supposed to do that at the autograph tables. You have to pay separately for photographs and autographs at these events. Pictures are done prior to the autograph sessions, but both of them posed with me & someone who was with Fergie also took pictures of me with him. I guess because of my t-shirt, which is a whole OTHER story. On Sunday not only did my dream come true & I met my personal hero, but I know what I told him meant so much to Ernie. Just remembering the look in his eyes I know it meant a great deal to him personally to hear what a tremendous source of inspiration and hope he had been to me over the years. I am grateful I was able to give him that gift. Stuart scored MAJOR points with this one. He’s given me some lovely presents over the years, but I really think this one even out-does those 2 trips to Maui. For me, to be able to tell Ernie to his face how much an autographed picture he had sent me had inspired me to complete 3 degrees at 3 different universities, I nearly made him cry. It was an incredibly touching moment. Thinking back on our meeting it makes me feel just like those feel-good sports movies where the underdogs finally win the big championship or the long suffering ball player finally gets his big break and hits it out of the park. We all cry because we’re happy for them and it reaffirms our faith that yes, dreams DO come true. 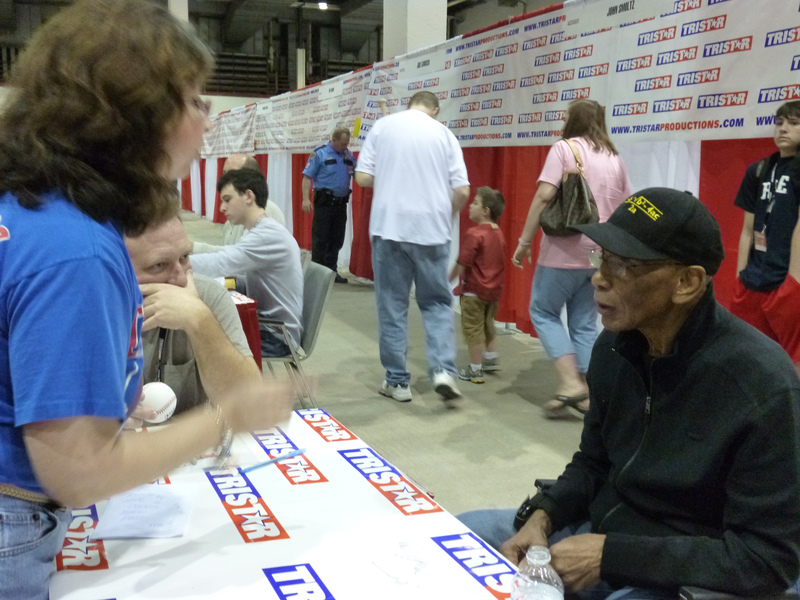 Ernie Banks as I will always remember him. I did find that autographed picture. I had it so well and safely stored that it took me six hours of searching to locate it. Today I scanned it and sent it to Ernie along with the pictures Ariel took of us on Sunday. Just in time too because tomorrow is Ernie’s 83rd birthday! 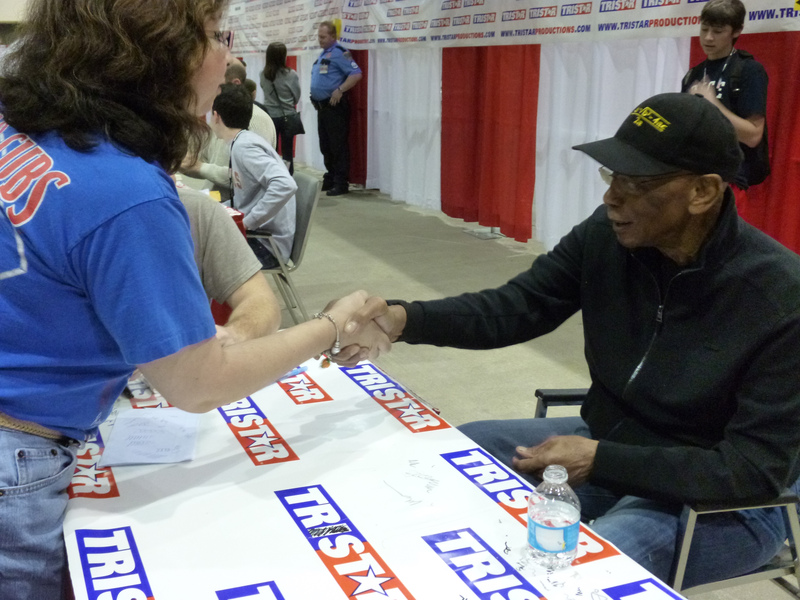 Ernie Banks is, and always will be, my personal hero. It was so gratifying to see in person what a truly NICE person Ernie is, worthy of the title of HERO in my book any day. Dreams do come true. Just keep them close to your heart, guard and protect them, and never allow anyone to tell you that you cannot do something. If you can think it up, you can do it. I did! Ernie Banks: Chicago Cubs 1953 – 1971. Inducted into the Baseball Hall of Fame: 1977. Vote: 83.8% (first-time ballot). Stats: 512 career home-runs, .274 batting average, 2,583 hits, 1,636 runs batted in & countless kids made happy when he visited them in hospitals or stood outside the ballpark after a game signing autographs. 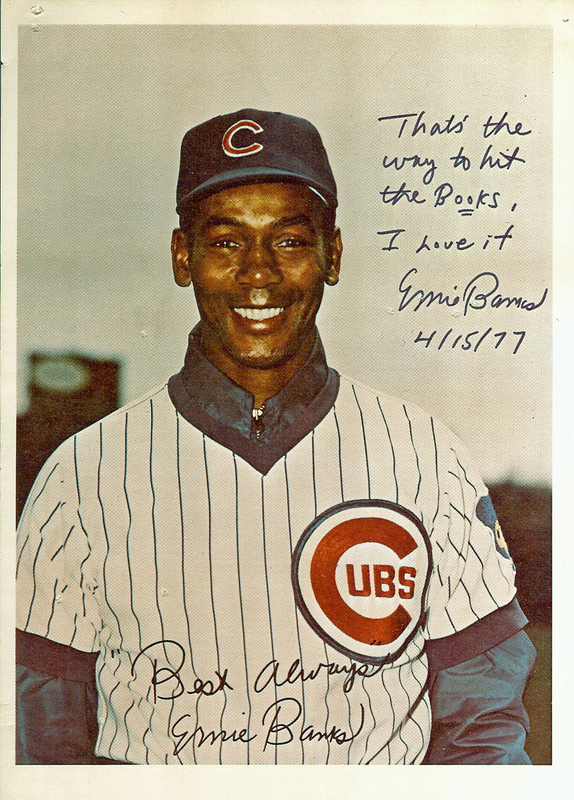 On Friday the sport of baseball lost the great ambassador it ever had, the great legend, Ernie Banks. I am heartbroken at the realization the world is now a smaller, darker place without Ernie here, but I console myself with the fact that his Spirit will shine on forever & will encourage others from the world of spirit. Perhaps one day, soon – you never know – he may help the Cubs get to a World Series. Ernie, hopefully before I die, please. Just ONE. You changed my life & helped me to overcome tremendous obstacles to get to where I am today. I am blessed to have been able to tell you that I OWE IT ALL TO YOU. 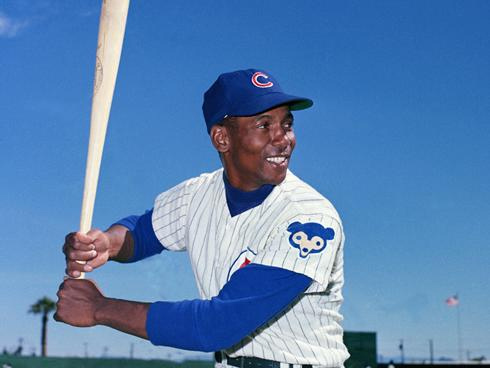 God bless you & RIP, Mr. Cub. Your legacy will never be forgotten. For video coverage go to: http://wgntv.com/2015/01/24/the-legacy-of-ernie-banks-mr-cub/ where WGN-TV of Chicago has posted some lovely tributes. If this is your first time visiting my blog, thank you & to all of Ernie’s fans out there, let’s play two!